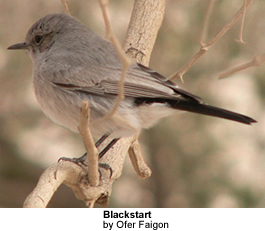 The Blackstart,Cercomela melanura, is a chat found in desert regions in North Africa, the Middle East and the Arabian Peninsula. It is a 14-16 cm long bird named for its black tail, which is frequently fanned; the rest of its plumage is bluish-grey or grey-brown (the actual colour varies geographically, North African races being browner, Middle Eastern races bluer). Males and females look alike, but the male on average has blacker lores (the regions between the eye and bill on the side of a bird's head). The song is a clear melancholy whistle: CHURlee...TRUloo...CHURlee...TRUlur..., with short phrases from the song used as a call. It is a species of rocky deserts and mountain slopes which nests in a rock crevice where it lays its 3-5 eggs. It feeds on insects, taken mainly on the ground. The Blackstart is a confiding species, unafraid of man. The Blackstart is resident throughout its range. In Israel the species is primarily found in the Negev Desert, Arava Valley and Dead Sea areas; it is present in areas of the Jordan River valley further north, but is scarcer there. In Jordan, the species is only found in western parts of the country, in areas from the Jordan River valley south through the Dead Sea region to the Arava Valley and Aqaba Mountains.